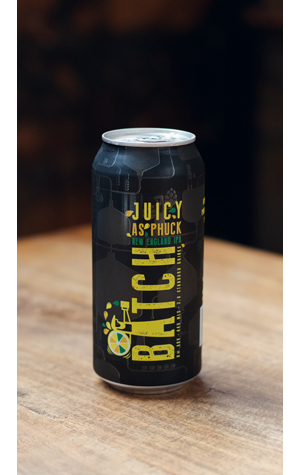 The ever-evolving Juicy beers keep coming at Batch, with a slightly modified re-release of their double New England IPA, Juicy As Phuck. From a technical perspective perhaps the most significant thing of note is the use of a Nottingham yeast, as opposed to a more common Vermont yeast. That aside, it’s all familiar territory. This is a beer with an absolutely rampaging tropical fruit character – like drizzling a tin of pineapple juice over a peach and mango salad. But what else could you reasonably expect from hurling Mosaic, Centennial, Vic Secret, Chinook and Cascade hops at it? Because of the NEIPA’s distinct lack of bitterness, that fruity/juicy melange is left unconstrained. Indeed, the hops have been given so much room to roam that even they’ll be in there looking at each other and wondering: “Yo, where’d the motherphuckin’ bitterness go at?” It’s thus disturbingly drinkable for an eight percent ABV beer, giving away few hints at its strength until you stand up with a big smile and slightly wobbly legs. It’s not especially hazy for a NEIPA, but with such a surging flavour you’re better off not worrying about it. Just phucking enjoy it.